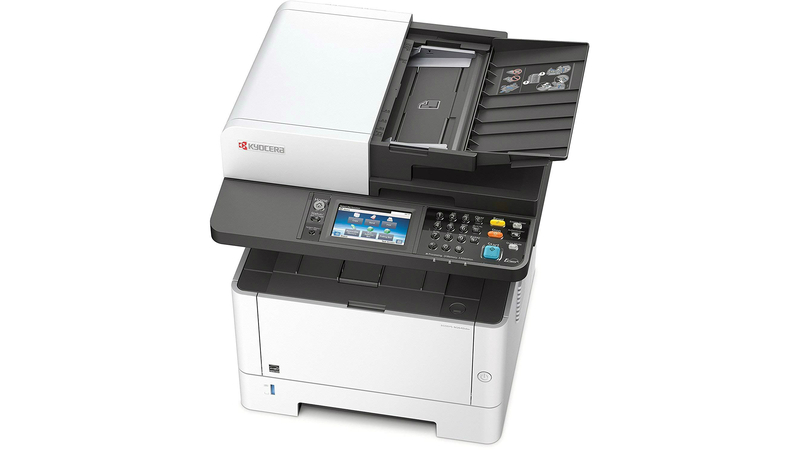 At around £500, Kyocera’s Ecosys M2640idw is expensive considering it’s based on a mono laser printer. While you don’t get colour, you do benefit from a claimed 40ppm print speed, support for wireless and Gigabit Ethernet networks, duplex everything, a fax modem and control through a 10.9cm colour touchscreen. The details are impressive, too: the 50-sheet ADF contains dual scanning elements, so it can capture both sides of an original in one pass, and you can rattle off double-sided copies or faxes with the minimum of hassle. One area where Kyocera skimps is the standard 250-sheet paper tray – at this price, and with such a fast printer, we’d expect something capable of swallowing a ream. Frustratingly, although you can expand the printer with one or two additional trays, these also only take 250 sheets. If you want to load a full ream, you’ll have to split it into two. This isn’t a good looking device. The scanner unit is wider than the printer base it sits on, with ponderous overhangs at each side. Making things worse is the substantial front lip housing the control panel – neither the panel nor the scanner bed can be lifted up to give better access to the 150-sheet output tray. Overall, however, it’s fairly compact, and although the printer makes a good deal of noise, it’s free from loud clacks or clunks, and quickly pipes down after a job – it’s not too antisocial to share a desk with. We encountered a bigger annoyance in Kyocera’s setup program. While the print and scan drivers installed without issue, the scanner wasn’t automatically configured and added as a TWAIN source – you need to manually run a configuration utility, choose your device from a huge and badly sorted list of models, then manually provide its IP address. This wouldn’t be so bad, but there’s nothing obvious to tell you about this step, which led to a few minutes of head scratching when we came to scan. Get the M2640idw up and running and there’s precious little time for sitting around. It’s very fast, delivering its first page of text in just eight seconds (18 seconds from cold), and going on to complete our test at 34.1ppm. Mono graphics shot out at a breakneck 28.2ppm, while duplexed graphics arrived at 15ipm – one of the fastest results we’ve timed. The printer was barely troubled by photos, dispatching two 10 x 8in images in 16 seconds, and printing six 6 x 4in images onto three sheets in 19 seconds. We timed a single-page copy at seven seconds and a ten-page copy at only 23 seconds. Although a ten sheet duplex copy did take 70 seconds, that’s still an impressive 17.1ipm. 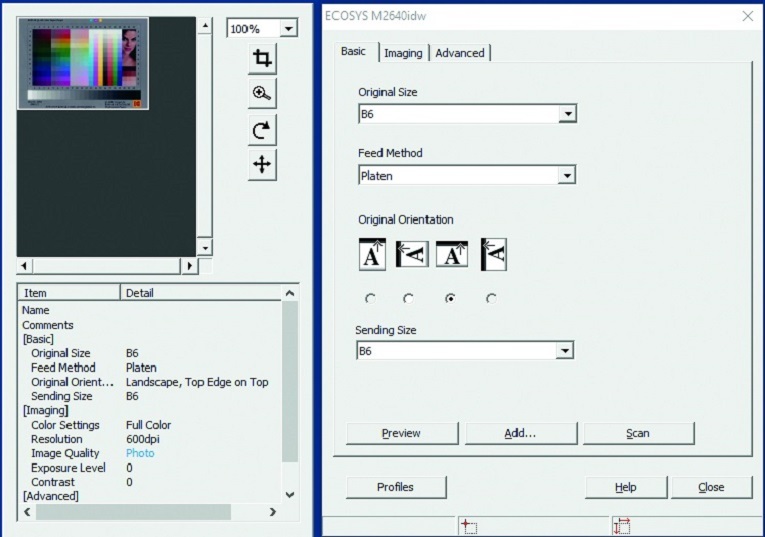 Scans were – surprise – very quick, with a preview completing in nine seconds, and a 6 x 4in photo captured in just 14 seconds at either 600 or 1,200dpi. We scanned an A4 page at 300dpi in nine seconds, but our other test resolution – 150dpi – wasn’t available among the presets. Generally speaking, this MFP’s speed doesn’t come at the expense of quality. Text was sharp and black, only starting to appear more faint on thin fonts of 8pt or below. Graphics were well exposed and sharp, although they weren’t entirely free of banding. Photos (never a mono laser strong point) were surprisingly good, even when printed directly from a USB stick. We were happy with the sharpness, colour accuracy and exposure of our test scans, although we found it hard to apply the perfect crop in the scan interface’s tiny preview window; photo scans might need a bit of tidying up in an imaging program. The only real disappointment was that photocopies were too dark: lightening them up by a couple of steps preserved more detail, but caused some lighter shade fills to appear patchy. The M2640idw has a ceramic drum that’s guaranteed for the lesser of three years or 100,000 pages, so in all likelihood it will only ever need new toner. It arrives with enough for 3,600 pages, after which replacements last for twice as long, minimising waste and hassle and promising running costs of about a penny per page. It may be expensive to buy, but the M2640idw is cheap to run, ruthlessly quick and produces decent results. 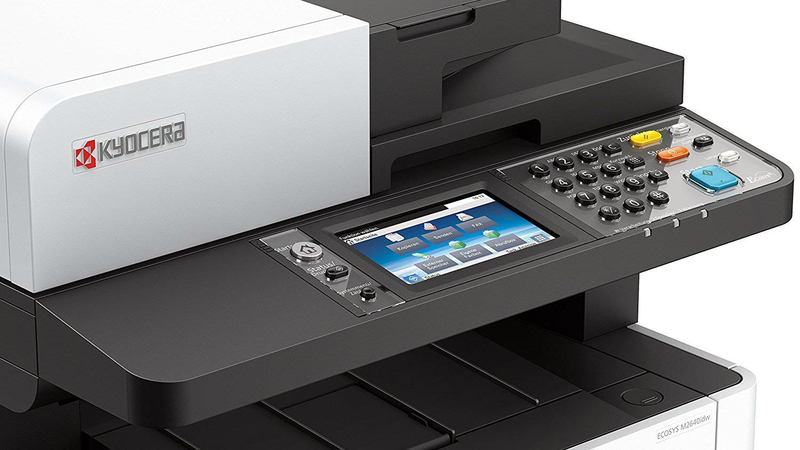 If you aren’t bothered about colour prints and need a heavy-duty office MFP, it’s a fine choice.